Dragon is confronted by the newest incarnation of the Fiend in his now burnt out apartment and recalls all of the previous encounters with her processor. 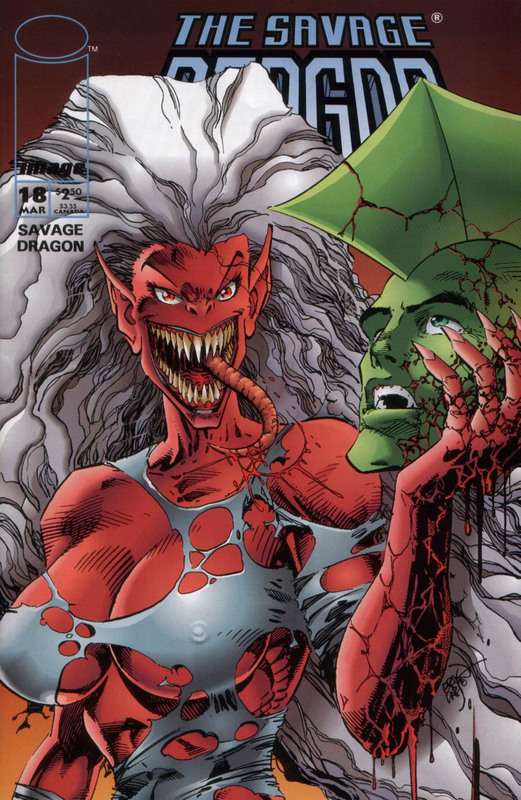 The villainess rants about how Dragon is guilty of seducing, defiling and finally murdering her daughter, Debbie Harris. Her hatred is increasing merely by being in front of the hero which goes to further empower the Fiend. Dragon points out that it was really Arnold Dimple that killed Debbie and that he merely took her in when her mother had kicked her out. He admits to feeling guilty over not having answered the door himself considering the amount of enemies he has made but beyond that he really is innocent. The Fiend dismisses all of this and punches her hand through his abdomen before carrying the hero away. OverLord is surrounded by a number of his Vicious Circle minions who have suggested that perhaps he should give up a fraction of his empire to others. This idea enrages the arch-villain who refuses to give up anything considering that it was him who built up their group in the first place. The villain FirePower bursts into the building and attempts to assassinate OverLord. He burns off his target’s cape before getting gripped around the neck. OverLord mercilessly snaps the neck of his would-be killer and declares that anyone that dares oppose him shall die. The recently resurrected CyberFace has now left Chicago’s underground and now walks through the city’s various alleyways. He is drawn towards the fugitive Octopus who is armed with a mechanism created by parts stolen from Donner Electronics. CyberFace is under the remote control command of Octopus and is led away. Dragon is finally dropped as the Fiend and he reach a cemetery where she uses her powers, altering her physical form, to bring up the now-animated corpse of Debbie Harris. The Fiend is distressed to discover that Debbie bears Dragon no ill will and merely hugs her former lover. She rips them apart from one another which tears off her daughter’s arms. Ray Wong reports that police officers in New Orleans have confirmed that Frank Darling is alive after his finger prints were discovered on the bus that was used to smash into SkullFace. He has been on the run from the Vicious Circle since he went missing but the good news is that at least he is alive. Ray continues to say how Mighty Man has been injured fighting Bludgeon and that several other members of Freak Force are also out of commission. Howard Niseman interrupts his colleagues as he was talking about Bludgeon’s death, leaving Ray to simply utter under his breath how Dragon’s apartment has been destroyed and he is now missing, news that upsets a nearby Rita Medermade. Alex Wilde continues to recover in Hillman Hospital where she is visited by William Jonson. He mentions how guilty Dragon feels over everything that happened to her when he was possessed. Alex comments that he obviously has not tried hard to apologise but William points out that every time Dragon has tried to make contact that Dale Fisher has intercepted. Dragon finally gave up so as to avoid causing a scene between him and Dale.